LAKE MARY – Maybe it was the prospect of coming up short for the fourth year in a row. Or maybe it was the disappointment of thinking the church was finally going to make its goal and realizing just before deadline that the goal was beyond reach. Pastor David Juliano, right, presents Florida Conference accounts receivable specialist Kitt Elliott with checks meeting Grace UMC Lake Mary's 100 percent apportionment goal. Photo by Gretchen Hastings. With only about two months left to raise money toward Grace UMC's apportionment share and just 50 percent of those funds in the till, Pastor David Juliano hit on a daring plan: Send the money back out with parishioners with instructions to go forth and multiply. "There were people who thought I was crazy," Juliano said. Even so, church leaders approved the plan, later dubbed "Talent Quest." One Sunday in October, Juliano preached a sermon based on the biblical parable of the talents. Church members were invited to take "talents," each worth $50, and find ways to double the money, with the goal of paying Grace UMC's full apportioned amount. It was a leap of faith in many ways. Juliano said he did not record names or keep track of how many talents people took. "We just gave them to people in complete trust, the trust that the master placed in his servants," the pastor recalled. As a result, Juliano presented payment for $14,400 to Florida Conference accounts receivable specialist Kitt Elliot one day before the Jan. 11 deadline for payment. And, he brought along an extra check for $1,560 toward the 2013 apportionment. "I'm pleased that apportionments have taken on such a life in the churches," conference treasurer Mickey Wilson said. It was a shining moment for Grace, the first time since 2008 that the congregation with regular attendance of about 170 has paid its assigned share in full. In fact, the congregation raised enough to get a jump on next year's apportionment. A young woman with musical gifts, Amy Parnell, and similarly talented friends staged a concert-and-meal event and collected donations. Kim Graboff, a Grace UMC member who participated in the Talent Quest fundraiser, shows some of the holiday decorations that helped double her donation to the church apportionment fund. Photo from Kim Graboff. "Since the word talent was in the title of our quest, that was really what brought me around to having the concert, as I considered what talents the Lord has blessed me with, and I feel like singing is one of them," Parnell said in an email to Florida Conference Connection. 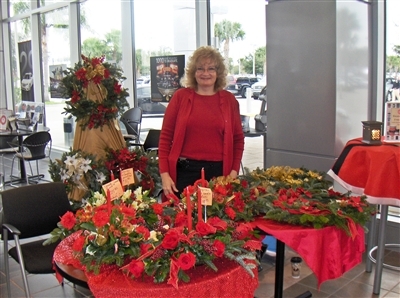 Kim Graboff, a florist, pooled her money with several others in the congregation and bought buds and trimmings to craft holiday decorations that could be sold to benefit the apportionment drive. She said the effort raised nearly $800, about double the amount the group invested. Cassie Yde, chairwoman of the church administrative leadership team, made a similar effort with other church members and sold jewelry at the church's fall festival to net $900, doubling the investment of $450. Grace McNabb, a church member since the early 1980s, was at worship the day Juliano distributed the money. She said adults were given $50 in an envelope, with the option of taking more. Children were given $5. "He said, 'I'm not going to ask you for money. I'm going to give you the money,'" McNabb recalled. "I thought, 'What a great idea.' It just starts the wheels rolling right away about what you can do." McNabb is retired, but she crafts origami figures for weddings and special occasions to supplement her income. 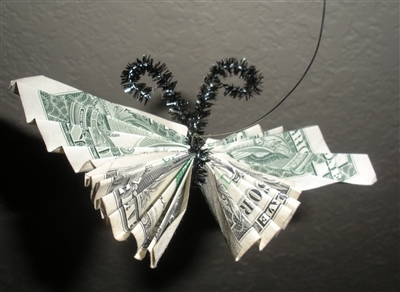 She decided to make origami butterflies and hearts out of the paper money and sold them for twice the amount of each artistically folded bill. Grace McNabb, a longtime member of Grace UMC, Lake Mary, fashioned origami figures from dollar bills and sold them to raise money for Talent Quest. Photo from Grace McNabb. "I was able to almost double my money," she said. "It makes you feel so good." Juliano said Grace UMC takes its responsibilities to the full connection of The United Methodist Church seriously and had regularly paid its apportionments in full until the economic nosedive of late 2008. The next three years, the church struggled, despite cutting staff salaries and eliminating a worship service. "We went from 100 percent [paid apportionment] to 16 percent in a single year," Juliano reported. By 2011, the congregation was paying more than 50 percent, and church leaders set their sights on paying in full for 2012. "I think what motivates people the most is understanding that part of what makes us unique as United Methodists is our connection," Juliano said. "We are able to do far more together than individually, and apportionments are the vehicle for that. … There's a synergy in apportionments. One plus one doesn't just equal two. It equals three or four."